This article is about calculating narcotic effects using trimix. For calculating decompression using nitrox, see Equivalent air depth. 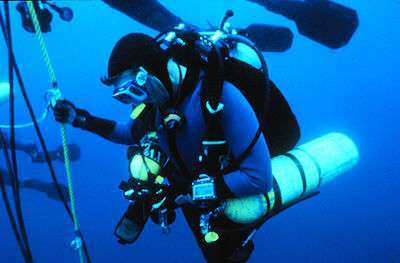 Equivalent narcotic depth (END) is used in technical diving as a way of estimating the narcotic effect of a breathing gas mixture, such as heliox and trimix. The method is, for a given mix and depth, to calculate the depth which would produce the same narcotic effect when breathing air. The equivalent narcotic depth of a breathing gas mix at a particular depth is calculated by finding the depth of a dive when breathing air that would have the same total partial pressure of nitrogen and oxygen as the breathing gas in question. For example, a trimix containing 20% oxygen, 40% helium, 40% nitrogen (trimix 20/40) being used at 60 metres (200 ft) has an END of 32 metres (105 ft). So at 60 metres on this mix, the diver would feel the same narcotic effect as a dive on air to 32 metres. So at 200 feet on this mix, the diver would feel the same narcotic effect as a dive on air to 107 feet. Since there is evidence that oxygen plays a part in the narcotic effects of a gas mixture, the NOAA diving manual recommends treating oxygen and nitrogen as equally narcotic. This is now preferred to the previous method of considering only nitrogen as narcotic, since it is more conservative. In this analysis, it is assumed that the narcotic potentials of nitrogen and oxygen are similar. Although oxygen has greater lipid solubility than nitrogen and therefore should be more narcotic (Meyer-Overton correlation), it is likely that some of the oxygen is metabolised, thus reducing its effect to a level similar to that of nitrogen. ↑ Hesser CM, Fagraeus L, Adolfson J (December 1978). "Roles of nitrogen, oxygen, and carbon dioxide in compressed-air narcosis". Undersea Biomed Res. 5 (4): 391–400. PMID 734806. Retrieved 2008-05-01.